The adult woodlice is about 15 mm in length, quite flat, and slate grey in colour with 7 pairs of legs. The female produces up to 150 eggs, which are contained in a brood pouch until the young hatch. 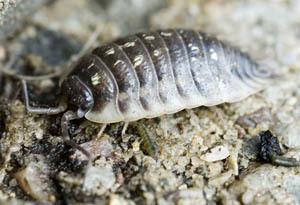 The young woodlice are white, approximately 2mm in length and can take up to one year to reach full size depending on food supply and temperature. You normally find woodlice outside where they can hide during the day in cool, dark and damp places – under stones and flower pots, in crevices, amongst dead and rotting vegetation etc. Why do they come indoors? Woodlice come indoors mainly during the winter and early spring, usually searching for protection from the onset of cold weather. They do not come indoors to breed, but there may be a colony of woodlice near an entrance to the house. Once woodlice find their way indoors, particularly in warm dry rooms, they will die from water loss within a day or so. They may survive, however, under sink units in kitchens and bathrooms for some days, or even longer, particularly if they have access to food debris. Do they do any harm? Woodlice are harmless, and despite their name, do not damage wood. As described above, a small amount of harm may be caused to young foliage. If disturbed, woodlice are particularly known to curl up into a ball. How can I get rid of them? Sealing entry points (draught excluders around doors and windows, for example) can be tried, together with removing of other potential shelters near to the house – flower pots etc. Alternatively, by warming up parts of the house where woodlice have been found should help. Apply insecticide spray or dust to crevices or opening where woodlice may be hiding, or to damp areas which cannot be properly dried. This will discourage their presence.